Let’s face it. 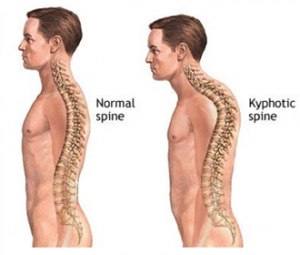 Most people are quite stiff in their spines and kyphotic. It’s a big word for excessively rounded forward in the upper back. Just think of a person that slouches. Extensive daily sitting, lack of regular movement and exercise, forgetting to breathe, playing on our cell phones and many other bad habits we’ve picked up along the way are among contributors to the spine becoming stiff. Back problems are the number 3 reason people go see the doctor. This is crazy, since most back problems are self-inflicted and can be reduced, managed and even eliminated by moving the spine. I’m sure you’ve heard the saying “an apple a day keeps the doctor away.” I feel the same way about daily spinal motion. There are so many more reasons to move the spine. For most people, the thoracic spine (middle of spine where the ribs attach) is very stiff. It shouldn’t be, because it was designed to move. That’s why we add as much thoracic movement to our classes at Body Harmonics whenever we can. When you begin to add these motions to different positions or to some of the daily movements and exercises you already know, the possibilities are endless. Some are simple and some can be more complicated. Today I’m giving you a few ideas for you to start with. The exercises below are effective and safe for most people without major spinal conditions. If you have a spinal condition, make sure to consult with your physiotherapist or health care professional to see which movements are safe for you to do. If you’re in the middle of work, have challenges with balance or if your range of motion is limited and you have difficulty getting into other positions (often with older adults), seated exercises are a great option. Sit tall in your chair with your feet flat on the floor. Cross your arms over your chest. Look to the right with your eyes, then turn your head to the right. Continue by turning the shoulders. Return to the middle. Repeat to the left. Continue this motion 3-5 times in each direction. Note: in this exercise, it’s very easy to lean back while rotating your spine – try not to do this and stay very upright. Sit tall on a chair with your feet flat on the floor. Place your hands behind your head. Look down at your cheeks to lengthen the back of your neck then keep rounding you upper spine forward to look at your thighs. Restack your spine until you’re tall. Inhale as you sit even taller in your seat and let your head tip back a bit in space as your breastbone lifts to the sky. Make sure to keep your entire spine long from your tailbone to the top of your head. Restack your spine and repeat 3-5 times in each direction. Sit tall in your chair with your feet flat on the floor. Place both hands on top of your head. Reach the top of your head into your hands and sitting bones into your seat. Create length up the front and back of your body (meaning don’t arch the spine to pretend you’re sitting tall). Staying as long in your torso as possible, tip your head and upper spine to the right. Then return to starting position. Repeat to the left. Continue this motion 3-5 times in each direction. Margot’s the founder of Body Harmonics and Body Harmonics Education and Kayaking is one of her favorite exercises. It works through three ranges of the spine at once and is fun to do. Sit tall in your chair with your feet flat on the floor. Place both hands behind the head and round forward slightly. Begin circling the arms forward one at a time like a kayaking motion. Do it until you’re tired or feel your spine moving more freely – that’s usually about 12-24 reps – it’s different for everyone. You can do this the opposite way as well by lifting your breastbone to the sky and kayaking backwards. STANDING & TALL KNEELING: You can repeat any of the above exercises in a tall kneeling or standing position. Just make sure the tailbone isn’t tucked under or sticking out too far. Your lower back should be in what we refer to a neutral position. This therapeutic-looking exercise is definitely one of our favorite exercises at Body Harmonics. We do it religiously in classes and privates as it does wonders for the upper back and delivers incredible results every time. Lay on your back with knees bent and feet flat. Reach your arms up over your chest and gently press your hands together. Keep your pelvis settled and start to turn your head and roll your upper body to the left then right. Continue rolling across your upper back allowing your gaze to follow your hands. Keep arms straight and palms together to get maximum benefit. Do this exercise as many times as needed to get fluid movement. Note: To enhance the motion, you can place a block under your head and a sit fit cushion under your upper back. Sit with your legs in a figure 4 position. Right leg bent in front of you and left leg bent behind. Reach your arms to your sides and bend your spine right, reaching your top arm overhead. Return to center and repeat to the left. Continue repeating 4-8 times. Prop yourself up on your elbow and lift your hips away from the ground. You want your entire body to be lined up from top of head to knees. Your feet can be behind you a bit. Reach your top arm to the sky, then bring your arm through the open space between your supporting arm and the floor, just like you’re threading a needle. Your hips might dip a bit, that’s ok. Return to start position. Repeat 8-12 times. Then do it again on the other side. Note: you can also do this exercise in a full side plank with your hand and feet on the floor. Get on your hands and knees. Press into the right hand and left knee and shin. Place your left arm at the back of your head. Turn your upper body to the left and look towards the wall. Keep your hips and lower body still. Return your body to starting position. Repeat 8-12 times. Then do it again on the other side. Note: this exercise can be done with the hand long at your side at shoulder height if it’s not possible to place the hand on the back of the head. I prefer the first option over the second because it minimizes the chance of ‘cheating’ by waving the arm around.